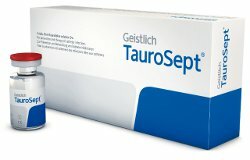 TauroSept™ - medical solution, taurolidine solution for catheter closure, used in prevention of bacterial and fungal infection in acute and permanent catheters, as well as in treatment of catheter-related sepsis. Unlike the antibiotics, taurolidine acts via a chemical reaction with bacterial cell wall structures and primary amino groups in bacterial endo- and exotoxins. It reduces the levels of proinflammatory cytokine and TNF. It hinders the adherence of pathogens and biofilm formation inside of the catheter. Ani-bacterial Spectrum: No development of resistance associated with usage of taurolidine which is practically impossible in relation to the mechanism of its operation, that is the chemical reaction inside the bacterial cell wall. Taurolidine is active among others towards: MRSA, VRE, VISA. and VRSA. TauroSept™ is used a solution for catheter closure. It may be used on a daily basis and repeated as long as the specificity of treatments using catheters and it should be inserted to the catheter after its installation / implantation / and after each completed treatment procedure as a filling and be removed before the next usage of the catheter . It should be removed before the next usage of the catheter.